OUR STORY: acey is belgian blue jersey cross. i feed him morning and night 4L he also has adlib meal hay and grass. his sire is hitman from the uk. he has had 5in1 which helps protect him from black leg pulpy kidney teknis and black dissicse. he can be very naughty and likes to break in the heifer mob. belgian blues come from belgium and are also heavily muscled and known for double muscle. Belgian blues are a beef animal and breed for meat. Acey and I are great friends and one day he will be a bull in dads herd. 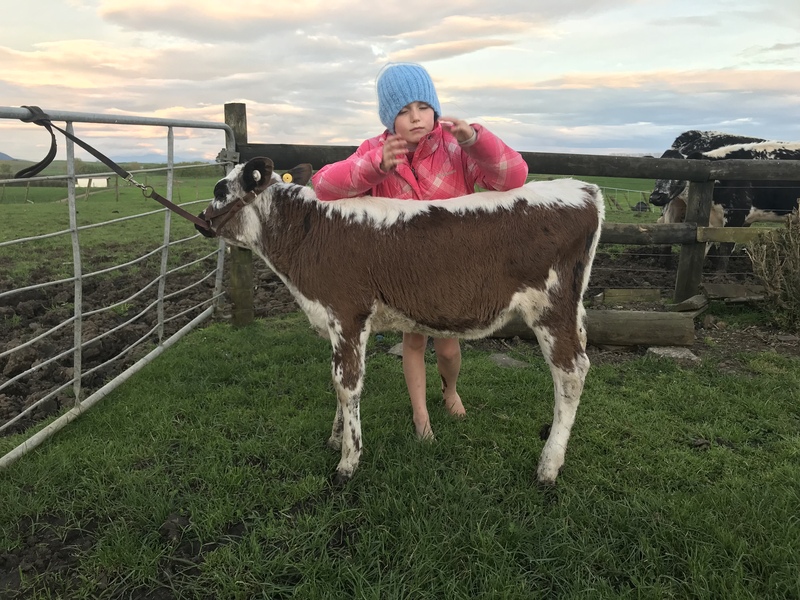 OUR STORY: My name is Amelia and I have a calf called Marshmellow Jellybean. On a nice hot sunny day when my calf is dirty I like to wash him and brush him. He is so pretty because he is a white galloway. He is not a good leader yet, we need lots more practice. I love him the best of all. Cleaning and brushing him is fun. I feed him 2 litres of milk in the afternoon and my mum feeds him in the morning while I am at school. He feels soft and fluffy and is my friend.